Homepage. 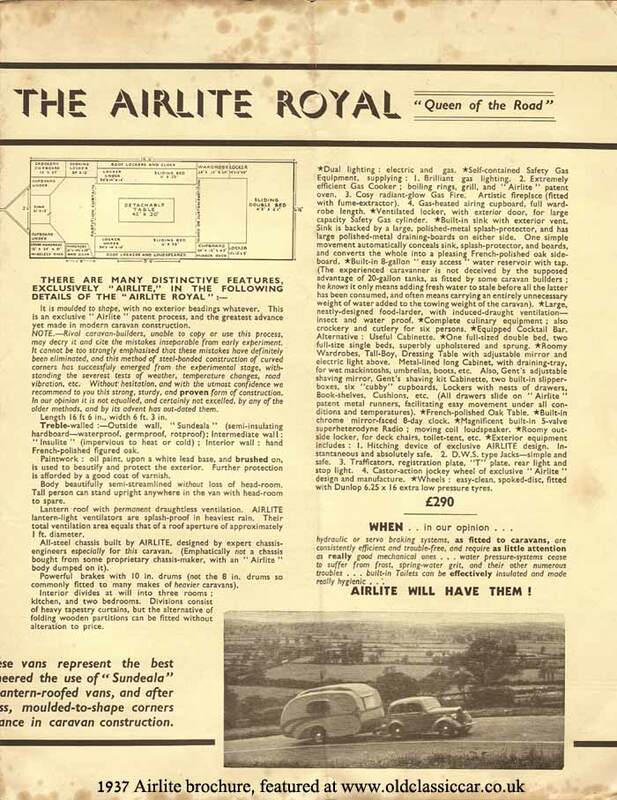 This page: Lovely old scans from a pre-war caravanning brochure issued by Airlite. Nick, one of the contributors to the classic caravan forum on this site, contacted me about an amazing discovery he made in a long-forgotten drawer. 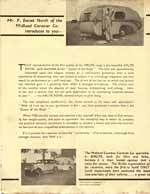 Tucked away was a pile of sales brochures from 1937, covering a colourful variety of caravan manufacturers, accessory suppliers, and even a few companies that sold trailers in the years leading up to the war. To say that this was an amazing find is a real understatement, and I'm so glad that he sent the scans over so that they could be featured here. Many makes of caravan, trailer and parts supplier are covered, including Airlite, Carapart, Winchester, Leason, Eccles, and Dixon Bate. 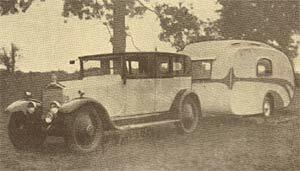 They will all be added to the old caravans section here at oldclassiccar over the following weeks. 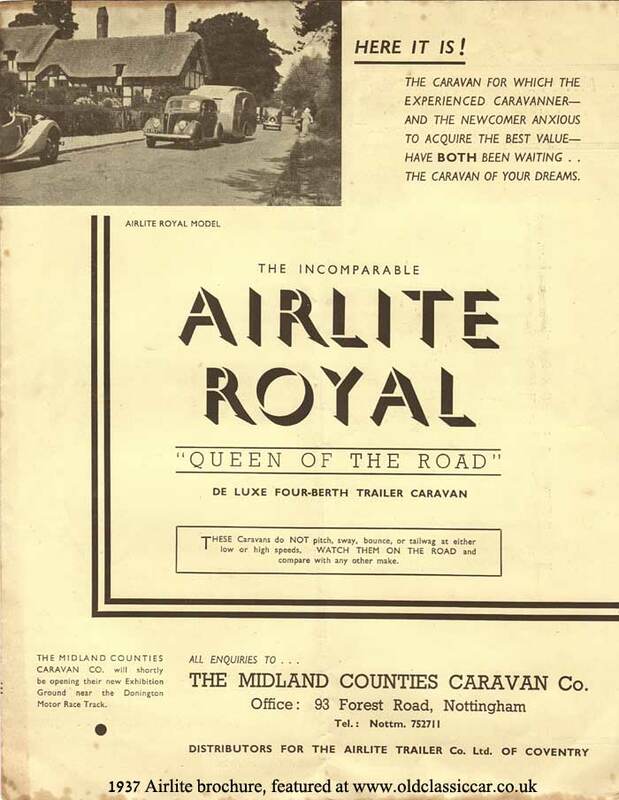 The front page of this caravan leaflet shows an idyllic country scene, with a V8 Ford towing an Airlite Royal, curiously down the wrong side of the road. Straight away the reader is encouraged to read more about this exciting new caravan - "The caravan for which the experienced caravanner - and the newcomer anxious to acquire the best value - have BOTH been waiting .. the caravan of your dreams" .... "The incomparable Airlite Royal 'Queen of the Road' De Luxe Four-Berth Trailer Caravan." In case you wondered, "These caravans do NOT pitch, sway, bounce, or tailwag at either low or high speeds. WATCH THEM ON THE ROAD and compare with any other make." 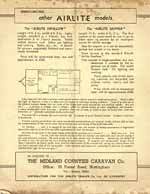 Enquiries regarding this new caravan were to be made to The Midland Counties Caravan Co., of 93 Forest Road, Nottingham. They also planned to open a new Exhibition Ground near the Donington Motor Race Track. "Truly representative of the fine quality of the Airlite range is the beautiful Airlite Royal, aptly described as the 'Queen of the Road'. This title was spontaneously bestowed upon this elegant caravan by a well-known gentleman with a wide experience of caravanning, who was invited to subject it to a thorough inspection and then watch its performance on a stiff road test. The driver of the fast car to which the caravan was attached gave it a gruelling from which it emerged triumphant. The critical eyes of the watcher noted the absence of sway, bounce, end-pitching and tailwag. Here, at last, was a caravan that did not give palpitation to an overtaking motorist anxious to pass! 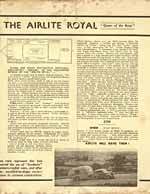 ... the Airlite Royal seemed simply to glide along. The test completed satisfactorily, the visitor turned to his hosts and ejaculated - "Well, all I can say to you, gentlemen, is this: you have produced a caravan that is the 'Queen of the Road'." When YOU see this caravan and examine it for yourself, when you note its fine contour, its low weight-centre, and pause to appreciate the wonderful way in which its complete and practical domestic equipment is concealed to present a lovely and salon-like interior, we feel sure of your unqualified endorsement of this opinion. If it is possible for a caravan to have the 'personality' of an aristocrat, a thorough-bred amongst caravans, then THIS is it." "It is moulded to shape, with no exterior beadings whatever. 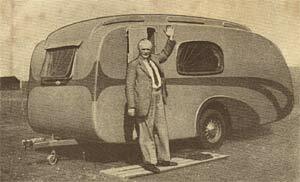 This is an exclusive "Airlite" patent process, and the greatest advance yet made in modern caravan construction. NOTE: Rival caravan-builders, unable to copy or use this process, may decry it and cite the mistakes inseparable from early experiment. It cannot be too strongly emphasised that these mistakes have definitely been eliminated, and this method of steel-bonded construction of curved corners has successfully emerged from the experimental stage, withstanding the severest tests of weather, temperature changes, road vibration, etc. Without hesitation, and with the utmost confidence we recommend to you this strong, sturdy, and proven form of construction. In our opinion it is not equalled, and certainly not excelled, by any of the older methods, and by its advent has out-dated them." "Treble-walled:- Outside wall, "Sundeala" (semi-insulating hardboard - waterproof, germproof, rotproof); Intermediate wall: "Insulite" (impervious to heat or cold); Interior wall: hand French polished figured oak. Paintwork: oil paint, upon a white lead base, and brushed on, is used to beautify and protect the exterior. Further protection is afforded by a good coat of varnish. Body beautifully semi-streamlined without loss of head-room. Tall person can stand upright anywhere in the van with head-room to spare. Lantern roof with permanent draughtless ventilation. Airlite lantern-light ventilators are splash-proof in heaviest rain. Their total ventilation area equals that of a roof aperture of approximately 1ft diameter. All steel chassis built by Airlite, designed by expert chassis engineers especially for this caravan. (Emphatically not a chassis bought from some proprietary chassis-maker, with an Airlite body dumped on it." 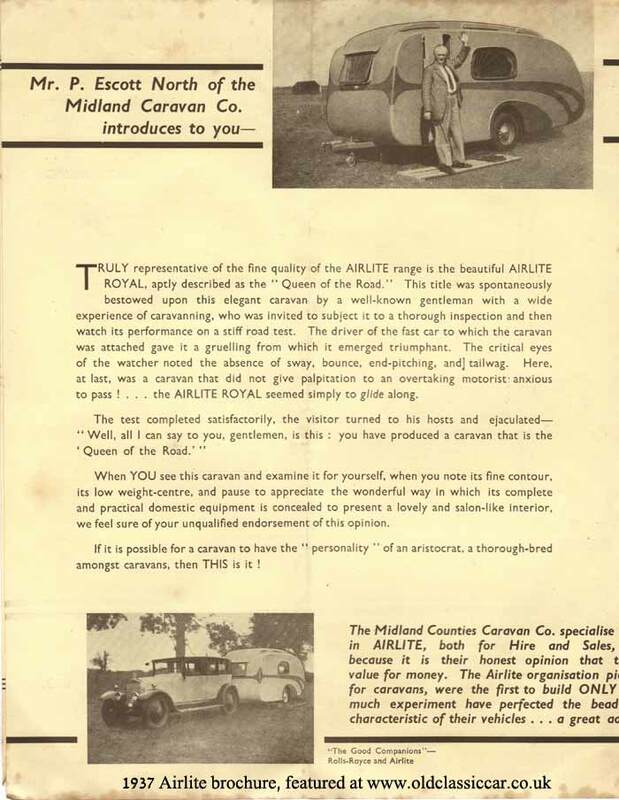 And so it continues, emphasising most strongly that no compromises were made in the design and build of this quality 30s caravan. 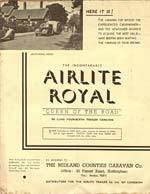 The final page gives a mention to some other caravans in their range, namely the Airlite Swallow, a 14ft 6in 2/3/4 berth van, and the Airlite Skipper, a 14ft caravan that was designed so that it could be taken apart (!) by an "intelligent novice for winter storage". I wonder if any of these survive, perhaps still dismantled in a long-forgotten, overgrown, shed somewhere? 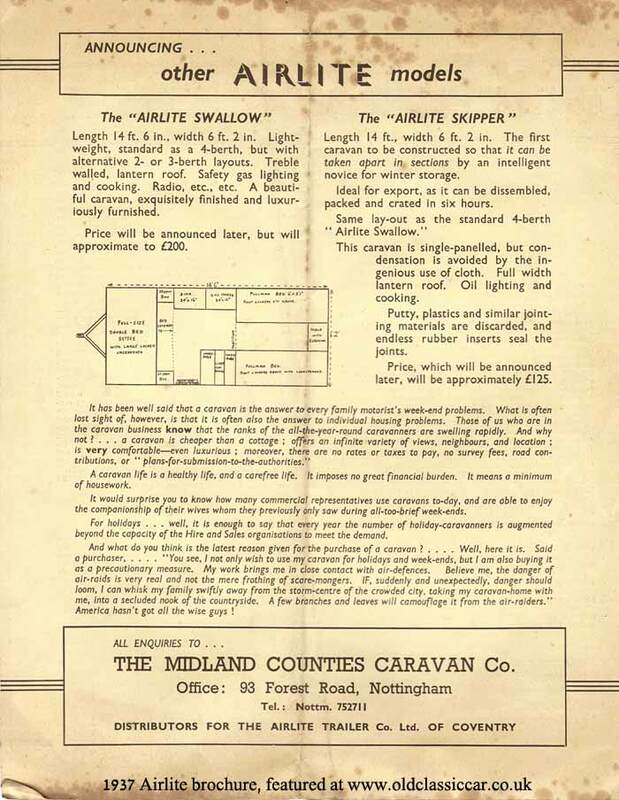 The Skipper was also touted as being "ideal for export, as it can be dissembled, packed and crated in six hours .... this caravan is single panelled, but condensation is avoided by the ingenious use of cloth. Full width lantern roof. Oil lighting and cooking. Putty, plastics and similar jointing materials are discarded, and endless rubber inserts seal the joints." A caravan life is a healthy life, and a carefree life. It imposes no great financial burden. It means a minimum of housework. It would surprise you to know how many commercial representatives use caravans today, and are able to enjoy the companionship of their wives whom they previously only saw during all-too-brief week-ends. For holidays ... well, it is enough to say that every year the number of holiday caravanners is augmented beyond the capacity of the Hire and Sales organisations to meet the demand. And what do you think is the latest reason given for the purchase of a caravan? ... well, here it is. Said a purchaser, ... 'You see, I not only wish to use my caravan for holidays and week-ends, but I am also buying it as a precautionary measure. My work brings me in close contact with air-defences. Believe me, the danger of air-raids is very real and not the mere frothing of scare-mongers. IF, suddenly and unexpectedly, danger should loom, I can whisk my family swiftly away from the storm-centre of the crowded city, taking my caravan-home with me, into a secluded nook of the countryside. A few branches and leaves will camouflage it from the air-raiders'. America hasn't got all the wise guys!" What I find amazing is that, even in 1937, people were already thinking ahead like this, not realising that a couple of years later their worries would very much be realised. Do any Airlites survive today? In the early 1990s I went to look at an old caravan that a friend of mine was buying, and the side view of it looked very similar to those shown in the Airlite photographs. It was a small-ish 'van, which makes me wonder if it was a Swallow model?